1. Their latest earnings continue to look good. I especially like the poke that this article takes at the activist-investor Daniel Loeb. He's still around? When is that guy going to take his ball and go home? Regardless, a profitable earnings reports is dull, but good. 2. The Dow chemists have been working hard and have developed a new plastic for Dow to sell. With as many chemists as Dow has, you would expect it to be some gee-whiz polymer with potentially mind-blowing chemistry and great potential to replace non-plastic materials with plastic. So what is it? An LLDPE (linear low-density polyethylene). LLDPE is actually a comonomer of ethylene and α-olefins. LLDPE's have been around for decades so this is hardly exciting or novel. But as the article notes, Dow's last major product introduction was in 2013 and was also olefin-based. What else would you expect when your former Chief Technology Officer goes on the record saying that "...[no] new polymers would be discovered, since chemists already had done a thorough job in finding ways to link carbon, oxygen, hydrogen, nitrogen and sulfur atoms." This definitely is in the dull-and-bad category. Hopefully the current CTO has a better outlook on product development. It's been far tooooo long since I commented on a research article, but it's time to change that. 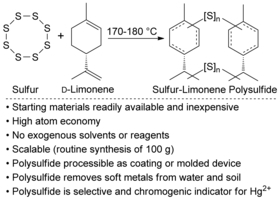 Angewandte Chemie has an open access Early View article on a new elemental sulfur/limonene polymer. The researchers are from Flinders University (South Australia) and the research has received quite a bit of press since it is able to capture mercury ions (Hg2+) from water, and as a bonus, changes color it does so. A further bonus is that sulfur is a waste product of the petroleum refining industry and limonene is a by-product of the citrus industry, (although somewhat more valuable than elemental sulfur). Simply melt the sulfur, add the limonene and wait. The sulfur rings upon heating break apart and form thiyl groups which react with the unsaturated bonds in the limonene. This is remarkably similar another sulfur/organic copolymer ($) that I blogged about 2 years ago (1, 2), which took the same approach of heat and dump. In both cases, the unsaturated organic compound needs to be low enough in volatility that the hot sulfur (> 170 oC) doesn't evaporate too much of it off. As is shown above, there are stretches of sulfur-sulfur (sulfide) bonds between the organic segments, and these are what capture the mercury (hence the old name for thiols of "mercaptans"). I did find it somewhat surprising that the amounts of sulfur:liminone were 50:50 on a mass basis. "An equal mass of sulfur and limonene was chosen to maximize the content of both industrial by-products in the final material." The authors themselves note that sulfur is produced at nearly 1000x the rate of liminone, so maybe trying to incorporate a little more sulfur would be a good idea. Additionally, the formula weight for liminone is 136 g/mol while that of sulfur (S8) is 256 g/mol, which further skews the ratio of the comonomers towards the limonene. October 28, 2013 - SoBe, What Were You Thinking? October 28, 2010 - Is this safe to eat? Back in July I wrote about the non-recyclability of the container used by Fairlife for their chocolate milk. The recycling code says "#7 PETE" which is problematic since PETE is #1 and "Other" is for #7. Since I didn't know how to sort it, it went into the garbage. I email went off to Fairlife to explain themselves, but their reply only muddied the water further, stating that a white pigment in the PETE made it a #7. That's not right since pigments do not affect the recycling codes for any other plastic. I speculated that there was likely a barrier layer that made the container a #7. Busted! There is a barrier layer in there. The identity of it is unknown, but ATR-FTIR did show the 2 main layers to be PET. So it's time to send another letter off to Fairlife. Hopefully I'll get a more truthful reply (and not so many words in ALL CAPS!). [*] Note: the person who did this analysis wishes to remain anonymous. I will respect that request and am very grateful for their contribution. October 27, 2010 - How to Get Around FDA Regulations - Legally! October 27, 2008 - So when are they going to ban Scotch Tape? Earlier this year it was announced that King Tut's iconic death mask had been damaged by some incompetent curators - the beard had been knocked off! - and then hastily repaired using epoxy that ended up getting everywhere. My take at the time was that the epoxy most likely contained BPA (bisphenol A) and thus the mask was being exposed to BPA for all eternity. But that concern is now being addressed, as a German expert has been assigned to repair the mask [*]. Since the depth of penetration of the epoxy is unknown, the time for the repair is vague, with 2 months being the outer limit at present. Apparently the construction of the mask is unknown (other what is on the surface) and so the repair team will take advantage of this opportunity to study it further. The details of the construction will then drive what approach will be taken to reattach the beard in a more suitable manner than the "Dumb and Dumber" approach taken last time. I can't imagine what would be done to reattached the beard. A mechanical approach would stand up the longest and duration has to be a great concern. After all, this object will be retained for millenia into the future and adhesives - organic, silicone or any other chemistry - will not have that durability. If they are used, it would likely be with the view that any adhesive would have to be removable at some future date so that it could be refreshened. (No more scraping off epoxies with a wooden stick.) But a mechanical approach would also be the most invasive and damaging, even if the outer aesthetics are immaculate. It possible that some good may come from the epoxy disaster. 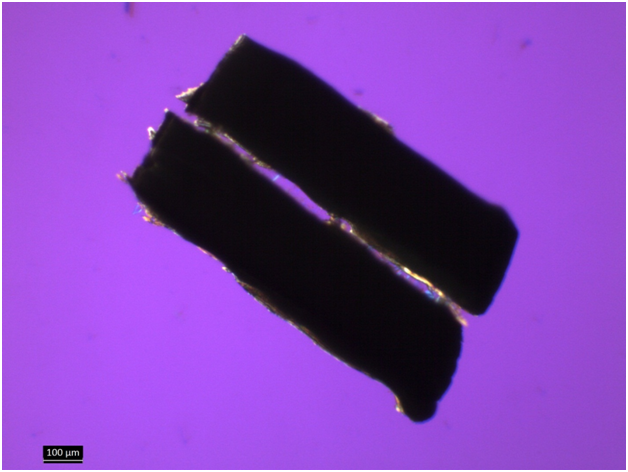 If epoxy did in fact penetrate the mask to some degree and then hardened, that material could then serve as a barrier to penetration from adhesives applied now and in the future. And that could put the adhesives option back on the list. We'll just have to wait and see what is approach is decided upon and what the justification is. [*] How do you get a job like that? Is it a free-lance position and what are the hourly rates? Choosing Biodegradable Polymers for a Research Topic? The topic came up this morning about what would be a good area to research for a Ph.D. nowadays. It was suggested biodegradable polymers, but I really dislike that area immensely. Biosourced polymers would be much better. Biodegradable polymers have their uses, particularly within medical applications, but as a general commodity plastic, something to take on the Big 6, they will be inherently problematic. Inherently. As in you cannot avoid the problems. To most people, biodegradability is a way to address pollution problems, but biodegradability is not an effective solution because a polymer will never biodegrade the instant it is released into the environment. Look at paper, a readily biodegradable material, but even paper doesn't biodegrade instantly. Paper products are a very visible type of pollution. Do crews cleaning up along highways, in parks and other public places pick up paper or do they leave it because it will biodegrade? Of course they pick it up. When you see paper products spread across a field, are you happy and not concerned because there really isn't a waste problem since it will all biodegrade and take care of itself? The minute any waste is released into the environment, it becomes pollution. Biodegradation is a long-term solution to immediate pollution, which means it isn't a solution at all. And while research on biodegradable polymers is not without merit, it is inherently limited in its potential to help civilization. No one has proposed or has even imagined creating a material that is smart enough to know when it should and shouldn't biodegrade, let alone one that would be able to biodegrade almost instantly once that decision is made. These are inherent limitations to biodegradability. Speaking strictly from a practical viewpoint, biodegradable polymers would not be my favorite subject to study in school because of the time-scale of the experiments. Once you have made your new polymer(s), testing for biodegradability takes weeks and months to perform. That's weeks and months before you get any feedback to let you know to stay-the-course or try something else. Industrial researchers can work with those time scales, but as a student? No way. Unless you want to take a decade to get that Ph.D. In much the same way that great revolutionaries seldom make great post-revolution leaders, CEO's are usually incapable of leading a company through more than one set of issues. Great turnaround artists don't work well for maintaining steady, long-term growth. The same goes for great acquistionaries, great sales-increasers, etc. The most recent example of that is Ellen Kullman, whom PlasticsNews is reporting to be leaving the CEO position of DuPont, having spent much of the year fighting of a stupid proxy fight, (probably the stupidest one I've ever seen). While she won the battle quite handily, she doesn't seem able to handle the new challenge. But regardless of the exact calculation, the slim number of prizes reinforces my long running argument that polymer chemistry is just a small fraction of the world of chemistry. Arguments that half chemists work in polymers have no merit. I ran some numbers earlier this year and came up with 8% or so as a more realistic number. This number in fact correlates rather well with the number of Nobel Prizes (4/62 = 6.5%). Whoever does win, I do hope that their research can be easily explained to freshman. I have a whole class full of them and being able to include this as enrichment material on Wednesday morning would be wonderful. It's been a good year for making tie-ins with current events. The timing could not have been better for ytterbium to be reassigned a new atomic weight, since I had just been lecturing about how the fractional abundances of isotopes contribute to atomic weights, and suddenly there was this real world example. Similarly, the discover of flowing water on Mars (on the basis of sodium-/magnesium perchlorate) was perfectly timed with a lecture on electrolytes in water (thank you NASA!). So if the people in Stockholm could give me a heads up so that I have time to adequately prepare, I would appreciate it. October 5, 2010 - Plasticizers = Positive Drug Test?